Over 3000 people showed up from the original 7000 (it was delayed a week). It’s hard to believe that it has been almost three months since my last Workout Wednesday post. It’s not REALLY that shocking when I think about how little “working out” I did in those three months, but even then I did do A LOT! 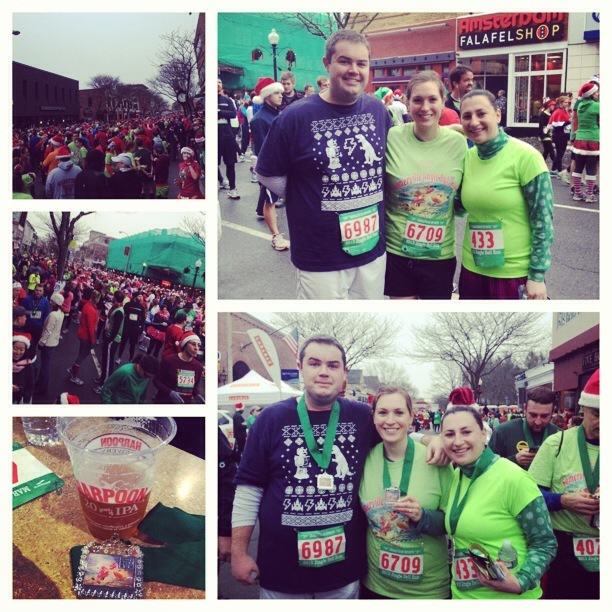 If you somehow missed it, I ran the Somerville Jingle Bell Run, my first 5k (to the right). I’m still super proud of myself and I ALMOST met my original time goal of 36 minutes (my time was 36:49) and will most definitely aim for it at the next one! And if you want to see some hilarious photos of me running the race click here. I apparently spend a lot of time looking at my feet/the ground when running and like to grimace a lot. Every time I saw a camera I was like don’t take a picture don’t take a picture don’t take a picture! But overall it was a LOT of fun and I can’t wait for the next one. I have already signed up for another 5k, the Rás na hÉireann U.S.A., in March and will probably do one in April while Hayley and Caroline (pictured with me) do their half marathon. The MAIN reason for the April 5k, aside from forcing me to keep the running going, is to see the venue where Caroline (in the middle of both photos is getting married in 2015). As for CrossFit I’ve failed miserably! From the October Workout Wednesday to the time this posts I will have only been SIX times and that’s not good! I’d offer excuses from sickness to work overload, but that’s done and I’m excited to get back into it. My first workout of the year was a good one, plus I know a lot of my slimming down I did in the end of 2013 came from a combination of a lot more walking and the high intensity of the WODs. In addition to all of the above, my sister got me a pretty awesome FitBit Flex for Christmas. It was the present I was MOST excited about and have loved having it! I’ve already noticed my making an effort to walk more and be more conscious of my pace so that I can reach my peak ‘active minutes’. It tracks all sorts of stats and you can even add other stuff in like your caloric intake and water intake (yay one less app!). But by far the coolest feature is the sleep tracking, the sensor is able to track your movements and tells you the times when you were restless and even awake (I guess based on body movements). The only thing that’s missing that I thought it included was heart rate monitoring, but that’s not too important to me. The only downside is that the MapMyFitness and FitBit connecting didn’t work as well as I wanted so I’ve had to keep them separate. If you use it shoot me an email and I’ll share my personal email address and we can be buddies! So with all of this in mind I’ve set a few goals for myself for 2014. They aren’t resolutions as I historically haven’t done well with them, but they are goals for the future and if they happen this year that’s even better! Go to CrossFit at least twice a week. Keep up the running! At least 2-3 times a week. Prep for a 10k in September – This is by far my biggest goal of the year. The Louisa May Alcott Orchard House (how fitting) holds a 5/10k every year and I figured why not make my fitness goal literary! 😀 And even if I don’t get up to the 10k I can at least do the 5k! Keep up the weight loss/slimming down. I have two more goals to go before I’m at my personal goal level. I lost around 40lbs last year (most of it gained back the year before) so now I’m into new territory. Continue to improve my eating habits, but the biggest focus will be on portion control. I eat relatively healthy most of the time but it’s definitely the amount that is my problem. If it’s there I’ll eat it and that’s a big no-no. I definitely need some motivation to get moving in the new year. Except for my weekly yoga class, I’ve been a slug since before the holidays. I bought myself a Fitbit for my birthday last year and I really like it, but I need to get more serious about trying to get my 10,000 steps per day! I’ve been surprised how often I’ve hit my 10k a day. Last night it was on my way to bed. Today it’ll be super early. It’s weird but it’s definitely encouraging me to walk an extra bus stop or two to make sure I get them in. The pictures are great! Did you happen to look at the people in the background? No one has a smile on their face while running a marathon. Haha! Great job, Geoff. I particularly like the “breathe out through the mouth” photos. Hee! Good luck with your fitness goals! I’ve been terrible and haven’t really exercised since September when I remembered that I don’t really like running. But I’m about to join a fitness center, and it’s right across the street from my apartment, so no excuses 😛 I’m looking forward to getting back into swimming, which I DO love. Thanks! I’ve never been a fan of running, but I’m hoping I have broken or am nearing breaking that invisible barrier that’ll make me love it. I miss swimming and am hoping to work that in over the summer, but the pool hours at the one I’d have access to are a bit weird. Dude the Louisa May Alcott run–I’m so so so jealous. I wish you the best of luck this year! We’ll see if I actually get to it. I was just excited it was literary inspired! I’ve heard much chatter about the fitbit flex lately…it seems like people really like it! Good luck with your 2014 Fitness goals! Thanks! I really like it, but my sister’s had a horrid experience. Her’s was broken out of the box and she can’t get a hold of anyone at FitBit (a tiny little company) for customer service help. I think she’s just going to return it and try a different type of tracker. She’s not impressed, whereas I’ve been most impressed with their software. It’s probably advisable, plus post places don’t even have any in stock.